A spider lily that makes a big impact in the garden is Lycoris aurea. Wonderful in the garden, and with a strong upright stem, magnificent as cut flowers. Commonly known as the ‘Yellow Spider Lily’ as well as ‘The Golden Spider Lily’ this is a larger growing variety than the more common red variety. Taller growing, a bigger flower head, and even larger bulbs this is a summer to autumn flowering bulb and it is easy care. This is a bulb that requires a hot dry summer to encourage it to flower. 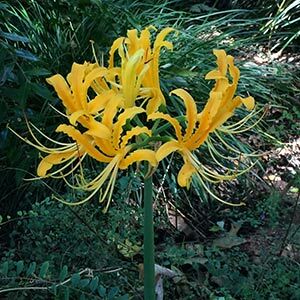 The Golden Spider Lily is best planted in late winter to early summer, the flower will shoot from the bulb well before the foliage. Lycoris aura is one of those bulbs that likes to left undisturbed. If you plant them it is not unusual for it not to flower the first year. It will just send up foliage. Usually by the second season it will flower well. A sunny position is preferred, however it will perform well in part shade, very deep shade is not suitable. A well drained soil is essential and an annual top dressing in spring with some blood and bone along with a bulb fertiliser seems to provide good results. It also appreciates a little extra lime and potash in our soil. Plant the bulbs with the neck of the bulb just below the surface of the soil. Bulbs are best planted at around 10 – 15 cm apart. Over time they will multiply to form a clump, and eventually you will need to divide them. Division is best carried out in spring, dig over the new planting area with some well rooted compost and replant bulbs at the correct level. Remember that they may not flower the first session after replanting. Common Name – Yellow Spider Lily, Golden Spider Lily. Postion – Full sun to a little shade. Foliage – Green, from autumn to early summer, dying back before flowering. Lycoris aurea is available for sale online from the following nurseries.